For many of us, there comes a day when you no longer venture into your teenager's room. This week, due to the "sisterly room swap" occurring at Chez Krafty1, we have seen things come out of the teenager's room that had long since gone "missing". One item that made it out for a bit of fresh air was "Grandpa's Socks". No, these particular socks never belonged to my Dad. 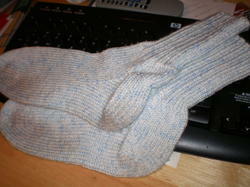 These were the second pair of socks I knit. 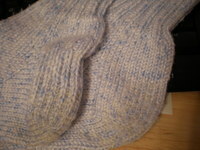 In January 2003, I taught myself to knit. (We found my first pair of socks last month.) In February 2003, I started a pair for Panda. Notice the difference. The sock heel from the surgical waiting room was worked in plain ol' stockinette. In my worry/stress/vigile, I'd forgotten to do the S1K1 of a traditional heel. Afterwards, when we knew Dad had come through with flying colors and I discovered my "error", I decided to keep the "mistake" as a memory of the day: Grandpa's Socks. Panda wears them (as is evident by the "permanent dirt residue") though not as often as she used to. She's the one who first called them "Grandpa's Socks" and wants to make sure that she doesn't "wear them out". Do you have a story to share of memorable socks? Leave a comment or link to your blog. I'd love to see other stories. Quick Side Note (that can't wait for Web Wednesday): For some of you in the northern half of the Northern Hemisphere, have you seen the space shuttle and international space station? Find out if and when you'll be able to for only a few more days here: NASA Spaceflight Sightings. We went out tonight and it was SO COOL! It looked like the lights of two aircraft flying in tandem with each other right above us. Oh wait...they ARE two aircraft flying in tandem!!! Duh!